Sheet Straps Fits with fitted sheet and flat sheet; Exclusively designed, this versatile bed sheet gripper works with all types of bedding and requires no heavy lifting. And with the strong build of these straps, your bed sheet will stay in place for a long time and keep your bed looking great at all times. The bed sheet cover grippers are made of sturdy chrome metal clips and heavy duty elastic bungee cords that will grip your bed sheets firmly. 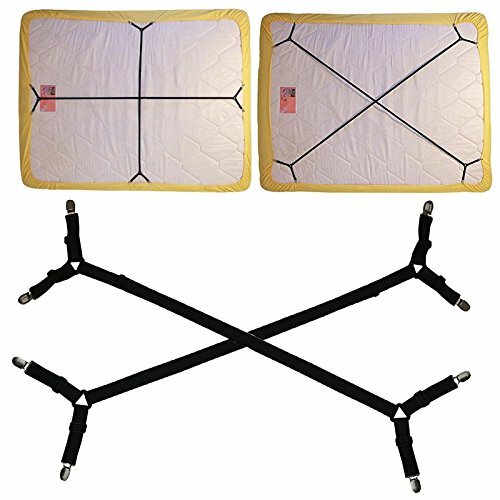 Easy to put on and keeps sheets in place and no more fixing sheets, adjustable length allows desired tension. Triangle designs, which avoiding the elastic sliding all the time. 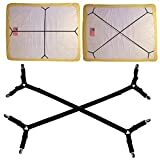 YYST 3-Way Bed Sheet Holder Triangle Model Bed Sheet Fastener Bed Sheet Gripper Bed Sheet Clip (Set of 4) Two Tie Stays for Free ! Bed Bandxl. Not Made in China. USA Worker Assembled. 50% Longer.. Smooth Sheets on any Bed. Bed Sheet Band, Holder, Gripper, Suspender, Strap. Sleep Better. Bed Band White Not Made in China. 100% USA Worker Assembled. Bed Sheet Holder, Gripper, Suspender and Strap. Smooth any Sheets on any Bed. Sleep Better. Patented.